The leafy portion of a plant’s embryo. The embryo is the part of the seed from which a mature plant develops. It consists of a short root, the radicle, and a short bud, a plumule, connected by a short shoot, the hypocotyl, that bears one or more cotyledons. Because they form within the seeds, cotyledons are known also as seed leaves. Flowering plants, called angiosperms, have embryos within their seeds that form one or two cotyledons, also often referred to as “seed leaves”. 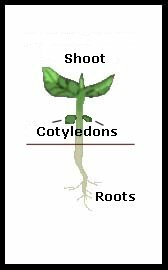 Those with one cotyledon are known as monocotyledons or monocots. Monocots include daylilies, orchids, palms, bananas, pineapples, and corn. Most have leaves with parallel veins and flower parts in multiples of three. 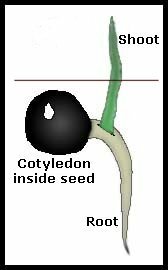 Angiosperms with two cotyledons are called dicotyledons or dicots. They produce leaves with a netlike pattern of veins and flower parts in multiples of four or five. Apples, cherries, beans, squashes, and tomatoes are common dicots.